Greek Grandmaster and champion Vasilios Kotronias is the winner of the Aegean Open Championship “Ikaros 2016”. Kotronias collected 7,5 points in 9 games. Despite the presense of many strong foreign participants the 2nd place went also to a Greek player, FM Stathes Gazis who gathered 7 points and continued his traditions of very good performances at Ikaria (he was the winner in 2013). The next three places (also with 7 points) went to Vitaly Teterev, Dusan Lekic and Antonis Pavlidis. At 6.5 points we find Milan Pastircak, Kostas Georgiou, Maria Gevorgyan (top female player) and Matthias De Wachter. Places 10 to 16 went to Romain Pickard, Alexander Kharitonov (a mediocre result for the highest rated player of the tournament), Nikos Skalkotas (top veteran player over 65), Bonno Pel, Ioulia Makka (top Greek female player), Thanasis Karagiannis and Ilarion Dorfanis. The title of Aegean Champion (top player from an Aegean club) went to Kostas Mouroutis while the title of Female Aegean Champion went to Marianna Gourgari (both are players of Ikaria Chess Club). First place and gold medal in Group B’ went to Konstantinos Zaires, second place went to 11 years old Sofia Georgitsi (also first female player in Group B’) and third place went to Konstantinos Davilas. 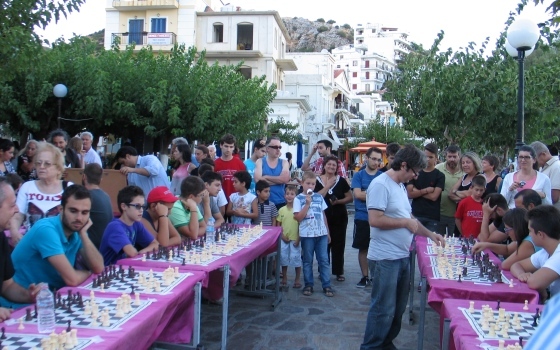 The International Chess Tournament “Ikaros” 2016 is organized by the Municipality of Ikaria and Ikaria Chess Club while the main sponsor of the event is the maritime company Hellenic Seaways. Particularly important for the success of the tournament is of course the assistance of local clubs and bodies such as the Cultural Association “I. Melas” and the Commercial Association of Aghios Kirikos as well as the support of local businesses and producers like Natural Honey of Ikaria of Antonis Karimalis, Honey Products AMALIA of Evangelos Christodoulou, honey “Frixos” of Apostolis Karimalis, Traditional Sweets of Ikaria of Teskos family, Winery of Kostas Tsantiris and Traditional Refreshments “Ikaria” of Kefalos family. Worthy of a special mention are the donations of Rudy Zacharias, who donated her artistic creations and Stamatis Vassilaros and Isabella Mela who donated books. Very important was also the support of the websites that promoted Ikaros both in Greece, like Skakistiko.com as well as internationally, like Chessdom.com or the websites that offered live transmission of the games such as Skaki.gr, Chessdom Chess Arena,Chessbook.net and My Chess Apps. It should be mentioned that the technical support of live transmission from Ikaria was carried out by Maria Petsetidi and Michalis Roukounakis.